Factual error: During the boat chase scene, Bond throws a grappling hook/anchor from the old boat he is driving onto the deck of the rubber boat "riding" his. The rubber boat is then violently yanked off of Bond's boat and crashes. This makes no sense. For the rubber boat to be yanked off that way, the other end of the anchor line would have to be tied to something stationary. However, the other end of the line is just lying in Bond's boat. There's even a shot of it sitting there. Revealing mistake: In the roof top chase between Bond and Mitchell, it is obvious that both characters are wearing black running shoes, when in the previous scene both wore smart black suit shoes. Factual error: Cars in Bolivia are required to carry both front and rear registration plates. In the movie hardly any of the cars shown have one. Continuity mistake: When Bond is on the plane with Mathis, and asks the waiter for his usual drink, between shots, Mathis' hair changes - in some shots there's a lock of hair on his left down by his eye, in some shots he's got two bits of hair loose on his right, and in others his hair's all in place. All this without him ever touching it. Continuity mistake: At the beginning during the car chase, the lorry has its tyre shot out and smashes into the wall breaking its wing mirror. When it steers back across the road, the wing mirror is in its original unbroken state. Continuity mistake: In the car chase scene at the beginning, the number plate of the Alfa changes once it goes from the road to the quarry. Factual error: Bolivia has no desert. It has a large highland called altiplano and the world's second largest salt desert. Both look totally different than the landscapes shown in the movie. 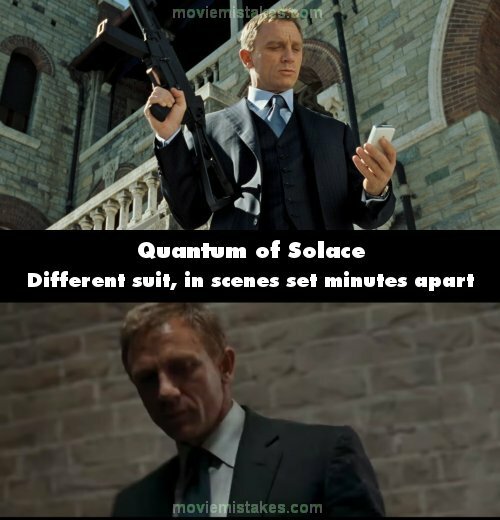 Continuity mistake: During the scene where Mathis dies in Bond's arms, the position of Mathis' head changes between some of the shots. 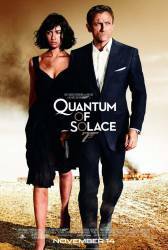 Factual error: During the film, Bond flies to the airport in Bregenz, Austria. There is no airport in Bregenz. Continuity mistake: While Greene is talking to his associates in Bregenz, the opera is approaching the end of act one which finishes just as Greene and Bond meet in the hall. However, at this point Mario Cavaradossi is suddenly being shot, which is the end of act three/the end of the opera. At the same time the music jumps to the end of act two, just after Tosca stabbed Scarpia; this scene is then shown while Bond is being chased. Factual error: The police chief mentions to General Medrano that the loud clanking noise they heard was the hotel's fuel cells. In actuality fuel cells are silent generators of power. Factual error: Bolivian police outfits and Chilean police outfits are similar. The ones in the movie are based off of the Bolivian outfit, yet the pants and hat are closer to the Chilean than the Bolivian uniforms.